We all love running in the summer, just grab your shoes and go. But, if you live in New Hampshire, you know that for a a good portion of the year you have to deal with dark, freezing cold, oft-treacherous streets and trails. Those types of conditions mean preparation and preparation, in this case, means gear. So, as we head into the cold months, here is my list of 12 pieces of equipment that are essential for every New Hampshire winter warrior. 1. Headlamp – Whether you run on roads or trails, a headlamp is indispensable for several reasons. First, with the short days, the extra light at your feet keeps you upright. It also increases your visibility to motorists. My favorite, the Petzl Tikka 2, has multiple modes including high, low and strobe. 2. Tights – If you’re a woman, you probably already know that tights are awesome. Men, we often stray from the because they are so, well, you know, tight. But whether you decide to where shorts over them or by themselves, tights are much less bulky and will keep you far warmer than just about any other bottoms out there. They can be expensive, but you can often find them cheap at T.J. Max or Marshall’s. 3. Gloves or Mittens – My hands get cold when it’s 50 degrees out, so I never leave home without a pair (or two) of mittens and/or gloves. Keep that frostbite away by investing in a decent pair (or two). Since I find gloves so essential, I prefer hybrid glove/mittens, which keep my hands warm but still offer dexterity when needed. 4. Reflective Jacket – Shorter, colder days mean more layers. I recommend a reflective jacket for the top layer, especially for night and morning runs. These come in differing weights, but since I always prefer to wear layers, I go with a light weight Brooks Nightlife LSD Jacket to better regulate my body temp. Brooks Nightlife Jackets are well designed and come in a variety of weights, including vests. 5. 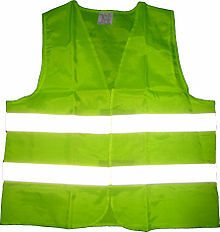 (Alternately) Reflective Vest – If you don’t want to invest in a reflective running jacket, reflective vests run about $10-$30, pack nice and small and still increase your visibility. 7. 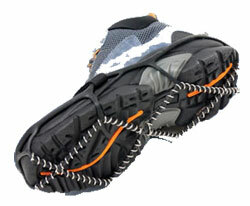 YakTrax or Micro Spikes – In ice or snow, stay on your feet with a pair of YakTrax or micro spikes. It’s like 4-wheel drive for running. Alternately, consider screwing sheet metal screws into the soles of your shoes. 8. 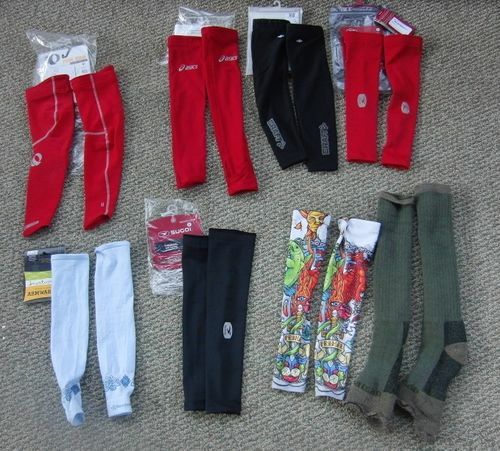 Compression Gear – As I mentioned before, I like to wear layers and a good compression layer is the best base layer. Most people probably think big bucks when they think about compression gear, but you don’t need to spend a lot of money on Under Armour or other over-priced name brands. Save money by shopping at either T.J. Max, Marshalls or simply buying an off-brand from your local box store – they work just as well. 9. Wool socks – These will keep your toes nice and warm and there are many options out there. 10. 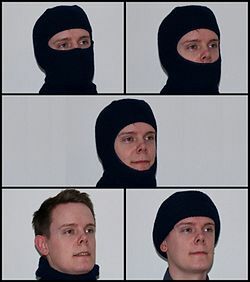 Balaclava – My wife gave me one of these for Christmas last year and it makes a huge difference on the really cold/windy days. It isn’t an essential piece of gear, as you could wear a hat/face wrap combo, but it’s a nice bit of convenience and comfort to have everything wrapped up in one piece of gear. Plus, you can pretend you’re a ninja if you want! 11. Beanie or Ear muffs – A standard beanie or pair of ear muffs are an obvious add to this list. There are a wide variety of options, including running caps with ear flaps, technical moisture-wicking beanies and headbands with catchy slogans. 12. Arm warmers – While not necessarily great for the dead of winter, arm warmers are perfect for the margins of the cold weather, when you’re not sure how many layers to go out in. They’re easy to take off and store if you get too warm and, conversely, easy enough to put back on mid-run. I also saw someone wearing a pair of old socks as arm warmers at the Jingle Bell Half Marathon, so if you want to save some dough, just cut the feet off of your old basketball socks! Have a question about gear or have a favorite piece of winter gear I didn’t touch on? Leave a comment and let me know. You can also catch me on Twitter – @outdoors_nh. Now get out there and run!